Summary (cliff) notes of introductory economics, first day - FreeEconHelp.com, Learning Economics... Solved! 1. People are rational, they use all available information to make decisions. It also means that prices in the market reflect what people think are the best prices to maximize profit, or happiness. Being rational doesn’t necessarily mean people always be the best decision. 2. People respond to economic incentives, people understand the costs and benefits of a decision when making decisions. There are two types of incentives, positive and negative (stick and carrot). Some examples are taxes and subsidies, and welfare vs parking tickets. What about red light cameras, they provide an incentive to not speed. 3. Optimal decisions are made on the margin, meaning the “next” or “additional” purchase or sale. Economists believe that all agents (firms, people, governments, etc.) should choose the optimal amount based on the principle of marginal benefit = marginal cost. What the next unit costs, and how much it benefits you should be equal. What goods and services will be produced? More cell phones or food? Oil rigs or tanks? Hair cuts, or Vegas shows? How will the goods and services be produced? Factories, or homemade? Robots or people? Labor in China, or Canada? Who will receive the goods and services produced? How income is distributed. Should everyone get an equal amount? How should wages be determined, who gets paid more/less etc. Centrally planned means that the government decides how resources and goods are distributed. Market economies allow households and firms to make decisions about resource and good distribution by interacting in markets. Mixed economies, mostly market with a hint of centrally planned (the government plays a role in economic resource allocation). There are two different types of efficiency: Productive efficiency and allocative efficiency. Productive efficiency means that the good or service is produced at the lowest possible cost. If we can re-arrange resources, technology or practices and produce the same amount at a lower cost than we are not at productive efficiency. Allocative efficiency looks at the interaction between firms and households. We are at an allocatively efficient point if every good or service is produced up to the point where the last unit provides a marginal benefit to society equal to the marginal cost of producing it, in other words, MB=MC for all goods and services. Equity: How “fairly” resources, goods and services are distributed. Some argue that those who work hardest should get more, some argue everyone should get the same amount. There is a tradeoff between efficiency and equity, imagine: who would study to become a doctor, if they could get paid the same amount to drive a taxi, be a janitor, or cook fries. 1. Decide and declare the assumptions of the model. 2. Develop a testable hypothesis. 3. Acquire data and test the hypothesis. 4. Revise the model if it fails to explain the data. 5. Publish the revised model, so future academics and students can learn from and contribute to the idea. Economists look at Positive analysis, which is analysis that is concerned with what is. Normative analysis is concerned with what ought to be. 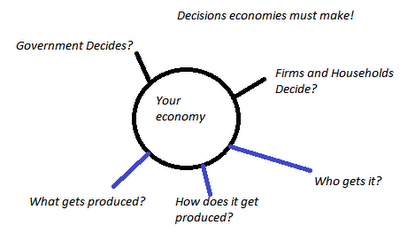 Factors of production or economic resources.